Like Hezbollah, Hamas believes that God is opposed to a Jewish state in Palestine. IN the summer of 2006, at a moment when Hezbollah rockets were falling virtually without pause on northern Israel, Nizar Rayyan, husband of four, father of 12, scholar of Islam and unblushing executioner, confessed to me one of his frustrations. We were meeting in a concrete mosque in the Jabalya refugee camp in northern Gaza. Mr. Rayyan, who was a member of the Hamas ruling elite, and an important recruiter of suicide bombers until Israel killed him two weeks ago (along with several of his wives and children), arrived late to our meeting from parts unknown. He was watchful for assassins even then, and when I asked him to describe his typical day, he suggested that I might be a spy for Fatah. Not the Mossad, mind you, not the C.I.A., but Fatah. What a phantasmagorically strange conflict the Arab-Israeli war had become! Here was a Saudi-educated, anti-Shiite (but nevertheless Iranian-backed) Hamas theologian accusing a one-time Israeli Army prison official-turned-reporter of spying for Yasir Arafat’s Fatah, an organization that had once been the foremost innovator of anti-Israeli terrorism but was now, in Mr. Rayyan’s view, indefensibly, unforgivably moderate. In the Palestinian civil war, Fatah, which today controls much of the West Bank and is engaged in intermittent negotiations with Israel, had become Mr. Rayyan’s direst enemy, a party of apostates and quislings. “First we must deal with the Muslims who speak of a peace process and then we will deal with you,” he declared. But we spoke that day mainly about the hadith, the sayings of the Prophet Muhammad, that specifically concerned Jews and their diverse and apparently limitless character failings. Special Mideast envoy Tony Blair says elements are in place for a cease-fire to end the fighting in the Gaza Strip. The former British prime minister was speaking Monday from Cairo, where he met with Egyptian President Hosni Mubarak following meetings in Israel. Blair is the Middle East envoy for the U.S., EU, Russia and the U.N., the four countries known as the Quartet supervising the Middle East peace process. He says that any plan to end fighting must also halt weapons smuggling to Hamas and open Gaza’s borders. Israel attacked the Gaza Strip on Dec. 27 to end rocket fire by Hamas. Some 870 Palestinians have died so far. Mahmoud Abbas hasn’t been in this much trouble with his people in four years as Palestinian president. Never very popular, he is widely dismissed here as ineffective and now he seems to have misread popular sentiment regarding Israel’s war on his Hamas rivals in Gaza. With continued international support, the Western-backed moderate will likely be able to stay on, despite Hamas’ insistence that his presidency ended Friday. But his declining popularity at home does not bode well for the inevitable next round in the battle between Islamic militants and Palestinian moderates seeking a peace deal with Israel. At the start of Israel’s offensive, Abbas, widely known as Abu Mazen, said the territory’s Hamas rulers were at least partly to blame, because they provoked Israel with constant rocket fire. Many West Bankers, even those who oppose Hamas’ violent ideology, view the war in Gaza as an assault on all Palestinians. Israel says it’s targeting Hamas strongholds in Gaza, but hundreds of civilians have also been killed. In West Bank homes, TVs are obsessively tuned to Arab satellite stations which run the brutal pictures of Gaza’s dead and wounded that Western audiences are less exposed to. “When it comes to Israel, we are all Hamas,” said Nablus resident, Hanan Izzat, 42. However, in recent meetings with advisers and Palestinian activists, he rejected more dramatic steps, participants said. Ideas raised included halting security coordination with Israel, suspending already dormant peace talks or releasing hundreds of Hamas security prisoners as a goodwill gesture. The fighting in Gaza continued on Monday with both sides accused of possible dangerous changes in the nature of the battle. But Israel paused the battle in Gaza at 10 AM Monday to allow humanitarian supplies to flow. CNN said the halt in attacks started at 10 a.m. (3 a.m. ET) and was set to end at 1 p.m. (6 a.m. ET.) Israel will allow in 160 trucks of humanitarian aid into the Palestinian territory through the Kerem Shalom and Karni crossings, Defense Ministry spokesman Peter Lerner said. This was the fifth day of humanitarian re-supply allowed by Israel. Human Rights Watch said Sunday that Israel’s military has fired artillery shells with the incendiary agent white phosphorus into Gaza. Israel said Iran is exerting heavy pressure on Hamas not to accept the Egyptian proposal for a cease-fire. Hamas representatives met in Cairo with Egyptian Intelligence Chief Gen. Omar Suleiman and his aides to discuss ways of ending the fighting in the Gaza Strip. The Hamas representatives reiterated their opposition to a cease-fire that did not include the reopening of all the border crossings into the Gaza Strip. Israel wants a new international inspection effort between Israel and Egypt to prevent the re-arming of Hamas. Despite the tightening Israeli cordon, however, militants still managed to fire off a rocket Monday morning which fell near the southern town of Kiryat Gat but caused no casualties, police said. On Sunday an Israeli official said the two-week-old military operation might be in its final days. The Israel Defense Forces said that there has been a dramatic drop in the ability of Hamas to launch rockets against Israel, Haaretz reported. Currently, the launches have dropped by 50 percent compared to to the first day of Operation Cast Lead, 17 days ago. 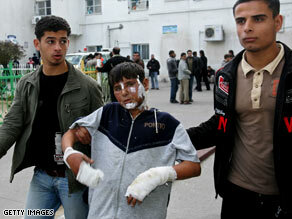 A burned Palestinian boy is helped as he leaves Kamal Adwan hospital in Gaza on Sunday. White phosphorus is not considered a chemical weapon, and militaries are permitted under laws of warfare to use it in artillery shells, bombs and rockets to create smoke screens to hide troop movements as well as bright bursts in the air to illuminate battlefields at night. Israel is not party to a convention regulating its use. Under customary laws of war, however, Israel would be expected to take all feasible precautions to minimize the impact of white phosphorus on civilians, Human Rights Watch said. Egyptian and Jordanian officials are worried that they see a fundamental tenet of the Middle East peace process slipping away: the so-called two-state solution, an independent Palestinian state coexisting with Israel. If Israel does not assume responsibility for humanitarian aid in Gaza, for example, pressure could compel Egypt to fill the vacuum; Jordan, in turn, worries that Israel will try to push Palestinians from the West Bank into its territory. Israeli troops pushed deep into the Gaza Strip’s most populated area Sunday, producing some of the fiercest fighting of the 16-day war against Hamas as Israeli Prime Minister Ehud Olmert declared that Israel is “close” to achieving its goals but is not there yet. The Israeli advance marked a possible precursor to a new phase of the conflict, in which Israeli forces engage Hamas and its allies in sustained urban combat. What’s the endgame for Israel and Hamas in Gaza? Tony Blair said sease-fire discussions are fruitful. Hamas continues to send rockets into Israel despite a more than one week assault from the Israeli Air Force and Army. And it is not yet certain that Hamas will relent. What is certain right now is that Israel will not stop its offensive until Hamas stops shooting rockets into Israel. The International community continues to urge a cease fire but in the UN the US has blocked resolutions demanding that israel stops its attack. Now France, Britain, Egypt, Turkey and other nations are apparently urging Hamas to relent and stop the rocket attacks. And Israel will not stop its offensive until Hamas stops the rocket attacks. French President Nicolas Sarkozy, who unsuccessfully proposed a two-day truce before the land invasion began, was due to meet with Israeli Prime Minister Ehud Olmert and Palestinian President Mahmoud Abbas. In Washington, the State Department said the U.S. was pressing for a cease-fire that would include a halt to rocket attacks and an arrangement for reopening crossing points on the border with Israel, said spokesman Sean McCormack. A third element would address the tunnels into Gaza from Egypt through which Hamas has smuggled materials and arms. Secretary of State Condoleezza Rice has spoken by phone with 17 foreign leaders — in Europe as well as the Middle East — in pursuit of such a cease-fire agreement, McCormack said, adding that much detailed work remains to be done. “We’re doing a lot of work on these three elements. The secretary is trying to get the international system and various actors in the international system to coalesce around those three elements,” McCormack said. “The situation now taking place in Gaza was caused by Hamas,” he said in the Oval Office. In Damascus, Syria, a senior Hamas official rejected the U.S. proposal. The deputy head of Hamas’ politburo in Syria, Moussa Abu Marzouk, told The Associated Press the U.S. plan seeks to impose “a de facto situation” and encourages Israel to continue its attacks on Gaza. French President Nicolas Sarkozy, who unsuccessfully proposed a two-day truce before the land invasion began, was due to meet Monday with Israeli Prime Minister Ehud Olmert and Palestinian President Mahmoud Abbas, who lost control of Gaza to Hamas in June 2007. While blaming Hamas for causing Palestinian suffering with rocket fire that led to the Israeli offensive, Sarkozy has condemned Israel’s use of ground troops, reflecting general world opinion. Sarkozy and other diplomats making their way to the region are expected to press hard for a cease-fire. A European Union delegation met with Foreign Minister Tzipi Livni on Monday. “The EU insists on a cease-fire at the earliest possible moment,” said Karel Schwarzenberg, the foreign minister of the Czech Republic, which took over the EU’s presidency last week. Rocket attacks on Israel also must stop, Schwarzenberg told a joint news conference with Livni. The EU brought no truce proposals of its own to the region because the cease-fire “must be concluded by the involved parties,” he added. With Israel pounding Gaza and killing Palestinians and the U.S. President-elect totally silent, it is difficult to find anyone in the Arab world that is gaining faith in Barack Obama and his ability to change the course of U.S. Middle East policy. “Change” sounded good to everyone but in a few weeks it may be too late to change the facts on the ground in Gaza: a lot of people will be dead and there may be new management. Many nations cancelled New Year’s celebrations to show support for the Gazans. But in Washington D.C. it is inauguration tuxedo rental time, it seems…. Barack Obama’s chances of making a fresh start in US relations with the Muslim world, and the Middle East in particular, appear to diminish with each new wave of Israeli attacks on Palestinian targets in Gaza. That seems hardly fair, given the president-elect does not take office until January 20. But foreign wars don’t wait for Washington inaugurations. Obama has remained wholly silent during the Gaza crisis. His aides say he is following established protocol that the US has only one president at a time. Hillary Clinton, his designated secretary of state, and Joe Biden, the vice-president-elect and foreign policy expert, have also been uncharacteristically taciturn on the subject. But evidence is mounting that Obama is already losing ground among key Arab and Muslim audiences that cannot understand why, given his promise of change, he has not spoken out. Arab commentators and editorialists say there is growing disappointment at Obama’s detachment – and that his failure to distance himself from George Bush’s strongly pro-Israeli stance is encouraging the belief that he either shares Bush’s bias or simply does not care. The Al-Jazeera satellite television station recently broadcast footage of Obama on holiday in Hawaii, wearing shorts and playing golf, juxtaposed with scenes of bloodshed and mayhem in Gaza. Its report criticising “the deafening silence from the Obama team”…. With Hamas weakened by Israel‘s Gaza offensive, Palestinian President Mahmoud Abbas is trying to regain a foothold in the territory he lost to the Islamic militants in 2007. Abbas is backing international efforts to end the violence, particularly an Egyptian proposal to deploy his forces on Gaza’s borders, along with other monitors. Yet he’s lost points at home for not displaying more sympathy for battered Gazans and for being perceived as too soft on Israel. It’s not clear whether Hamas has been weakened enough by Israel’s air and ground attacks to even consider relinquishing some power to Abbas in Gaza. Before the operation, the rivals were on a collision course, with Hamas saying Abbas’ four-year term ends Friday and that it will not recognize him after that. Abbas is heading to the United Nations in New York on Monday, after meetings with the French president and top European diplomats in the West Bank, to lobby for a …. Israel continued its air assault and ground attack in Gaza yesterday as both Hamas and the Israelis suffered additional casualties. Doctors worry about the humanitarian condition and deaths of so many Palestinians caught in the crossfire. The U.N. Security Council seemed to be gridlocked and no cease-fire was in sight, But France, Turkey, Egypt the EU and others vowed to restart the peace process today. Israel called up the reserves a few days ago. Last night, an Islamic leader called upon Allah. Turkish Prime Minister Recep Tayyip Erdogan, an ally of Israel, used exceptionally harsh words overnight on Sunday to describe Israel’s offensive against Hamas in the Gaza Strip, saying Israel would be punished by Allah….. But Israel shows no signs of letting up on Hama in Gaza. But neither does Hamas, which continued rocket attacks into Israel. 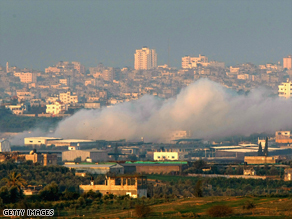 Above: Smoke rises after an Israeli air strike on the Gaza Strip early Monday. Israeli troops and tanks continued their offensive and Gaza was divided but not conquered. Even as President Nicolas Sarkozy of France readied a new quest for a cease-fire, Israeli forces took control of rocket-launching areas and surrounded Gaza City after slicing through the center of the beleaguered territory on Sunday. Israel Radio reported street fighting between Israeli troops and Hamas fighters in the streets of Gaza City early on Monday. Despite the onslaught, Hamas militants continued to lob rockets into southern Israel, witnesses said, as Gaza residents, fearful of growing casualties, faced severe power shortages and other deprivations. The reported death toll of Palestinians passed 500 since the assault began, including 100 said to be civilians. Five civilians die when shells hit a market, while most residents stay indoors to avoid Israeli shelling. ‘Anyone who survives this wave, it will be like they were born again,’ said one man. “Allah will sooner or later punish those who transgress the rights of innocents,” Erdogan said. His recent tour of the Middle East conspicuously skipped Israel despite the bilateral ties both countries enjoy. Erdogan has over the past week visited Egypt, Syria, Jordan and Saudi Arabia as Turkey engaged in shuttle diplomacy with Arab countries in the search for a cease-fire in the Middle East. Turkey could bring the Palestinian faction Hamas’ conditions for ceasefire to the attention of the United Nations, Prime Minister Tayyip Erdogan said late on Sunday, broadcaster CNN Turk report. “As a nonpermanent member of the UN Security Council, we could bring the conditions of Hamas for a ceasefire to the attention of the United Nations. Hamas officials have full confidence in Turkey,” Erdogan was quoted as saying. He also criticized Israel for laying the groundwork for provocation without removing the embargo on Palestinians. “Israel creates a humanitarian tragedy with using disproportional force. This would cause problems for Israel as well,” Erdogan said in the southern province of Antalya, without specifying what the problems would be. He said he would discuss the latest situation in Gaza in his meeting with Turkish President Abdullah Gul on Monday. Erdogan had visited Syria, Jordan, Saudi Arabia and Egypt after Israel launched air operation against Gaza in Dec. 27. He returned Turkey on Sunday as he ended the Middle East tour aimed at helping to reach a ceasefire in Gaza. Tens of thousands of protestors demonstrated in central Istanbul on Sunday, burning Israeli flags and chanting slogans, after Israeli tanks and ground troops moved in Gaza Saturday. You are currently browsing the archives for the Palestinian category.